Borderlinx | Buy Gizmine Japan and ship worldwide with Borderlinx. Cheap rates guaranteed. If you've ever wanted to own a Kermit the Frog dancing speaker you'll love Gizmine Japan gadgets. Gizmine Japan is a high-end gadget site; you could describe it as a collection of weird, wonderful gadget-type stuff. Gizmine Japan's hi-tech gadgets make a perfect choice for your technophile friends, and it has to be your first stop shop to find a gift for the geeks in your life. An offshoot of Dynamism, which sticks mostly to electronics, Gizmine Japan has extended its range into products like alarm clocks, robots, and USB-powered toys. Gizmine Japan's gizmo collection is easy to navigate on the website, where you can browse by product category or theme such as "Kawaii" ("cute"), "bling," or "wacky"; you can even browse the Gizmine Japan site by color to make sure your gizmo matches your home d?cor. Gizmine offers a huge range of delightfully inexplicable gadgets such as a Hello Kitty iPhone iPod speaker, Star Wars Necktie, and mackerel pen cases to a waiting world. Some gizmos are low-price, some more expensive, but there's a good range of prices and a great range of gadgets. 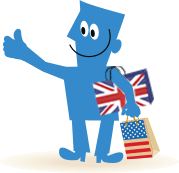 Now, with Borderlinx, you can shop Gizmine Japan wherever you are. Borderlinx ships to 64 countries. Here's how it works. Borderlinx calculates shipping and fees using the tax & duties calculator. A number of services are available through Borderlinx to make international ordering from Gizmine Japan hassle-free, including shipment value protection, free repacking and consolidation services.